As a historian, I really enjoyed watching Victorian Slum House on PBS. It shows (in quiet, realistic and graphic terms) how life was in the slums of London in the 19th century. 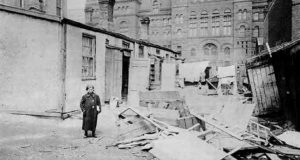 We here in Toronto also had some horrid slums on par with the appalling conditions that existed back in Victorian London. One of our worst slums was area known as the Ward (named for St John’s Ward). 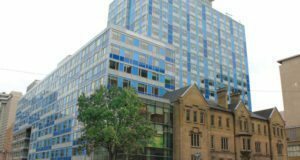 It occupied the blocks bounded by Queen, University, Dundas and Bay streets. Long before government assistance became law, if you were poor and destitute, you remained poor and destitute for the rest of your life. If you had more fortunate family and friends you would rely on on their good will for help. Underprivileged, friendless and poor people in Victorian England relied on the workhouse as a last resort. Often described as a prison for the entire family, the workhouse was a place where you were put to work doing menial, back-breaking jobs. It was a horrifying institution and lifestyle that Charles Dickens so brilliantly illustrated in his classics Oliver Twist and A Christmas Carol. As harsh as the conditions were in workhouses, it was still better than life on the streets. 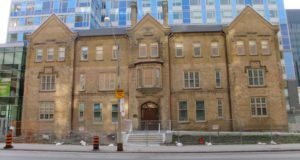 There were “benevolent” groups who wanted to introduce UK-style workhouses to Toronto. Fortunately a more progressive faction of reformers managed instead to found the Toronto House of Industry on a more humane ideology. However progressive the House of Industry might have been back then, by today’s standards it could also be viewed as appalling. 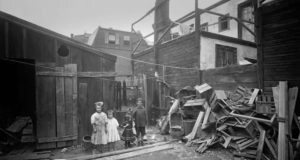 Long before the Children’s Aid Societies were set up at the turn of the 20th century, most abandoned children were left to their own devices living on the mean streets. 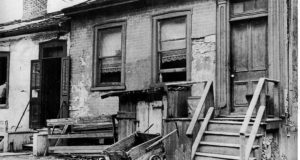 The House of Industry often would place abandoned or orphaned children as indentured servants in homes and farms in and around Toronto–which sometimes made their life worse than (or just as bad as) before. 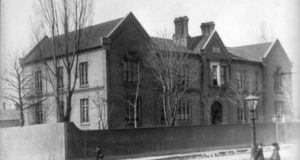 In the 1890’s the home was enlarged, this time by James Lennox (who ironically would go on to build the luxurious King Edward Hotel and the opulent Casa Loma). In 1947, as Toronto was moving towards a more progressive way of helping its vulnerable citizens, the House of Industry was renamed the Laughlen Lodge and transformed into a home for the elderly. By the 1970’s the 1890’s Lennox wings were demolished. Most of the original interior was gone by then, however the original 1848 Elm St. facade was saved and has been designated under the Ontario Heritage Act. The vestiges of the House of Industry building that still survive are a reminder of the time when our city was known as Toronto the Good. 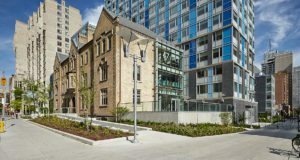 Today the House of Industry’s historical facade is incorporated into the new YWCA. Today the House of Industry’s historical facade is incorporated into the new YWCA. In 1947 as Toronto was moving towards a more progressive way of helping its vulnerable citizens the House of Industry was renamed the Laughlen Lodge and transformed into a home for the elderly. 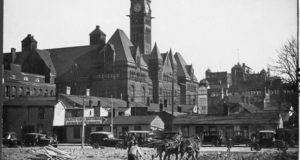 Toronto had some horrid slums with one of the worst standing where the reflecting pool in Nathan Philip’s Square at New City Hall stands today. As harsh as the conditions were in workhouses for many people it was still better than life on the streets. Long before government assistance became law, if you were poor and destitute, you remained poor and destitute for the rest of your life relying on family, friends and the good will of those more fortunate to help. In 1848 on the SW corner of Elm Street and Elizabeth Street a building known as the House of Industry was erected by architect William Thomas. 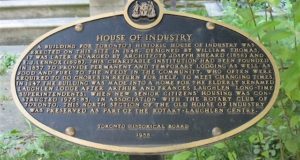 Historic plaque to the House of Industry. Andrea Meynell, MBA, Mortgage Agent with DLC Expert Financial, #12129. Andrea is a Toronto mortgage agent offering expert mortgage advice with integrity. She can help you access great rates. Based in the Leaside/Davisville area, Andrea serves clients across Ontario and beyond. Email her or call (416) 486-1113. 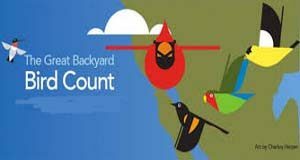 Click here for more information about becoming a content patron on thebulletin.ca.